I grew up in a tradition that employed what is known as the “sinner’s prayer.” The sinner’s prayer is viewed by many as the process whereby people ask to either “receive Christ” or “ask Jesus into their hearts,” and having done so, cross the threshold unto salvation. I was encouraged to pray it when I became a Christian. I’ve encouraged others to do so over the years as well. It’s become such a part of some church cultures that the sinner’s prayer is viewed as essential for salvation. How many parents have breathed sighs of relief when their children finally came to some point in their lives (at home, church camp, Sunday School) where they prayed the sinner’s prayer and finally “asked Jesus into their heart”? How many parents are still anxious for that day to come for their own kids? Praying the sinner’s prayer appears to be a pretty big deal. The only issue is such a practice isn’t explicitly in the Bible. In fact, having people pray something akin to the sinner’s prayer is a rather recent phenomenon in church history. It was popularized by modern-day evangelicals of revivalist/crusade stripes such as Billy Graham, parachurch groups like Campus Crusade for Christ and YoungLife, and denominations like Southern Baptists (who further tied it to other revivalist techniques such as the altar call1). The end-game for those who want to embrace the gospel isn’t a prayer about the gospel per se but belief in the gospel (Ac. 15:7, Rom. 1:16, Eph. 1:13, etc.). Does this mean using techniques such as altar calls or sinner’s prayers are bad? There’s some debate about that today. In my past ministry, I’ve done them all. Presently, I would say I stay away from some approaches while carefully using others. I consider the sinner’s prayer in the latter category. Christians must know a prayer-as-prayer never saves anyone. Getting hung up on the idea people must recite some kind of sinner’s prayer to be converted, to seal the deal, or guarantee the job’s been done, has more to do with magic than the Bible. You’re channeling Harry Potter the Wizard, not Paul the Apostle. The Scriptural witness is that it’s God via his Spirit that converts the soul (cf., Jn. 3:8). We receive the gift of salvation when each of us believes the promise of the gospel in Christ for ourselves. Did you hear that? The key is belief, not a prayer. Forgetting this may lead to running after the wrong goalposts. Dare I say, many have prayed a sinner’s prayer who still found themselves deeply in need of conversion. But to evidence genuine belief can only be the work of the Spirit of God. Now when they heard this they were cut to the heart, and said to Peter and the rest of the apostles, “Brothers, what shall we do?” And Peter said to them, “Repent and be baptized every one of you in the name of Jesus Christ for the forgiveness of your sins, and you will receive the gift of the Holy Spirit. Peter not only calls for belief (using the word repentance) but also expects gospel converts to immediately take the initiatory step of entering into God’s gospel community, the church, by being baptized. I’d go so far to say that if there is a declaration of faith endorsed by the New Testament, it’s not found in the words of the sinner’s prayer but the waters of baptism. If Romans 10:9 says that if we confess with our mouths that Jesus is Lord and believe in our hearts that God raised him from the dead, we will be saved, then baptism is the mark of that confession.3 No wonder the apostles so closely linked baptism with conversion. But because we want to make sure and not leave anything on the table, parents feel the need to have them pray the sinner’s prayer….just in case, ya know. I get it. I’ve prayed that prayer with all three of my sons. Honestly, I think I was doing it more for me than them. The truth was, they already believed. I was praying with Christians. I can’t bring conversion. I was simply seeing the Spirit blow and bringing new births. Having them pray a sinner’s prayer didn’t bring any real effect.5 The truth was they had already professed belief when I inquired of them why they wanted to “receive Jesus.” Their answers constituted a confession of faith. Which, at the risk of sounding like I’m talking out of both sides of my mouth, is why many find it helpful to walk someone through something like a sinner’s prayer. Doing so helps them better profess the faith they now believe. I practice it with regularity in my preaching. So, I’m not on the anti-“sinner’s prayer” bandwagon but want others who employ the prayer to do so with eyes open. Be sure to make the main thing the main thing: belief! 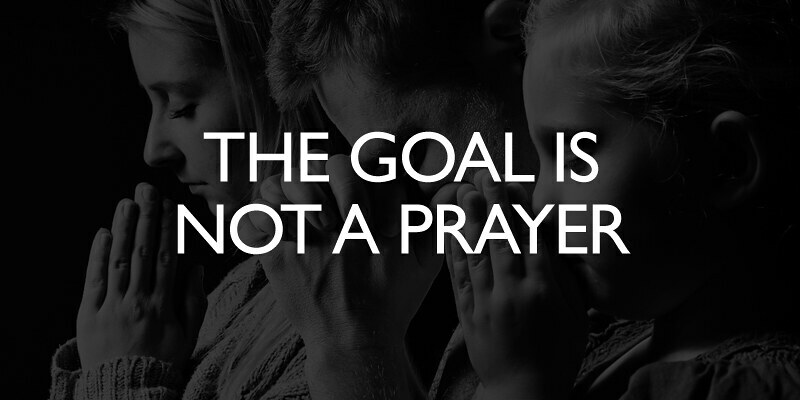 Parents, pastors, and followers of Jesus in general, the goal isn’t the sinner’s prayer because a prayer doesn’t save anyone. Only God does via his gospel. Ours is but to believe that gospel with all we are and professing that belief in the waters of baptism. That response can absolutely be in the form of a prayer. This is why, in some traditions, baptism is referred to as one’s profession of faith. Click here for my take on baptism and little children. I appreciate Trevin Wax’s wise words on this issue.